This year in Alsace, the excellent weather conditions at flowering time resulted in numerous and beautiful grapes. The rainfall at the beginning of the summer, then the high temperatures during the months of June and July, resulted in vivaciously fast vine growth along with large plump grapes. Except for Gewurztraminer which always has slightly small grapes, all the varieties this year developed an unusually large unitary weight over half the average size. Under these conditions the producers quickly deduced that the volumes would be large and they often proceeded with severe thinning-out of bunches. The month of August witnessed rapidly-progressing grapes, and everyone could legitimately believe that this would be both an early and an exceptional vintage year. 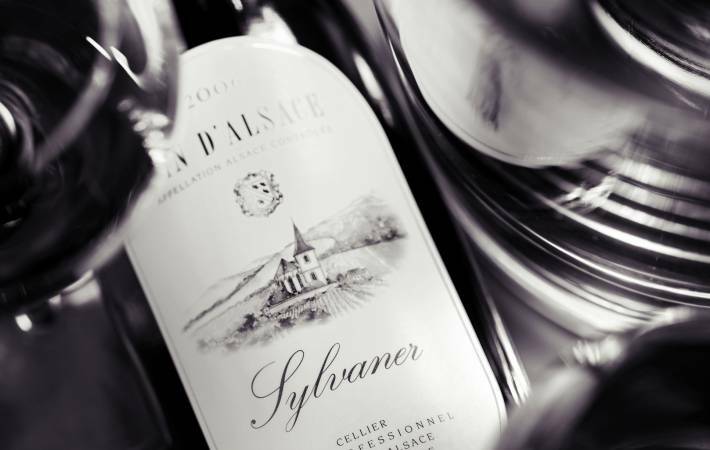 September 19 for AOC Alsace, Alsace Grand Cru and Crémant d'Alsace for all the grape varieties except Gewurztraminer, Riesling, Chasselas and Sylvaner whose picking dates were set for September 28. Fortunately, the rainy weather in September was followed by a sunny late autumn season at the beginning of October allowing the harvest to bring-in healthy and very-sweet grapes resembling some wonderful previous vintage years, notably for Gewurztraminer and Tokay Pinot Gris. Numerous and great successes for these grape varieties for Vendanges Tardives and Sélection de Grains Nobles, rewarding once again the efforts made by wine-growers who oftentimes had to take the voluntary risk of limiting their production. The 1994 harvest is 6% over the average with a volume of 1,236,000 hl for the 3 appellations of Alsace, Alsace Grand Cru and Crémant d'Alsace. This year AOC Crémant d'Alsace had a record volume as well as the Vendanges Tardives and Sélections de Grains Nobles whose larger volume than usual indicates the exceptional quality of a part of the 1994 harvest. A magnificent golden-colour cuvée with a wonderful glow. Very young on the nose with aromas of honey, dried apricot and peach. The palate is sweet and fleshy when it hits the mouth then tender with a perfectly integrated sweetness which makes it hard to guess the large amount of residual sugar. A remarkable wines which ages slowly and which has an excellent keeping potential. (Last tasted in October 2014). The combination of rain and sun during the summer of 1994 gave a generous harvest but also allowed for noble rot to appear. The lighter wines were very pleasant when young but quickly evolved due to their lack of density. However the richer cuvées and even Pinot Blanc have good ageing qualities. The year remains a reference in the production of Sélection de Grains Nobles, thanks to the rot quality.